The William T. Hornaday Award recognizes Scouts and Scouters for ecology efforts and service to conservation in their communities. To earn the Hornaday Award as an individual, youth members must earn a series of merit badges followed by a concentrated series of conservation and/or environmental education projects to be conducted in the member's community or nearby, under the advise of a trained conservation, naturalist, or environmental engineering expert. There are seven levels to this award -- the Unit Certificate for Scouting groups, the Badge (shown above), Bronze Award and Silver Award for youth, the Gold Badge and Gold Medal for Adults, and the Gold Certificate for outside organizations and corporations. Holders of the Bronze and Silver Awards and the Gold Medal may wear the square knot shown above. The Unit certificate is awarded by the local council to a den, pack, patrol, team, crew, or group of five or more Boy Scouts, Varsity Scouts, or Venturers for a unique, substantial conservation project. The Hornaday Badge is awarded by the local council to an individual Scout, Varsity Scout, or Venturer for outstanding service in conservation. 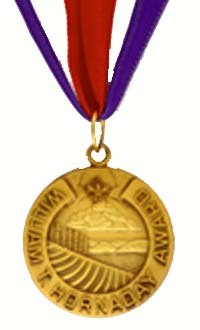 The Bronze medal is awarded to an individual for exceptional service in natural resource conservation or environmental improvement. A national committee judges the applications. The Silver medal is awarded to an individual for unusual and distinguished service in natural resource conservation or environmental improvement. Applications are reviewed three times a year by a national committee. See the BSA Hornaday Award Page and our Hornaday Award page for additional information, and CLICK HERE for application forms for the various awards. For a history of the Hornaday Award program, click here.